If you already loved the Altra Paradigm, this version will not disappoint, you're in for a treat! The Paradigm was inspired by tired feet at the end of the Badwater 135, and this version will not disappoint. It is completely revamped and updated with a knit upper for durability, integrated StabiliPods for support, and an Altra EGO midsole for resilience and bounce. 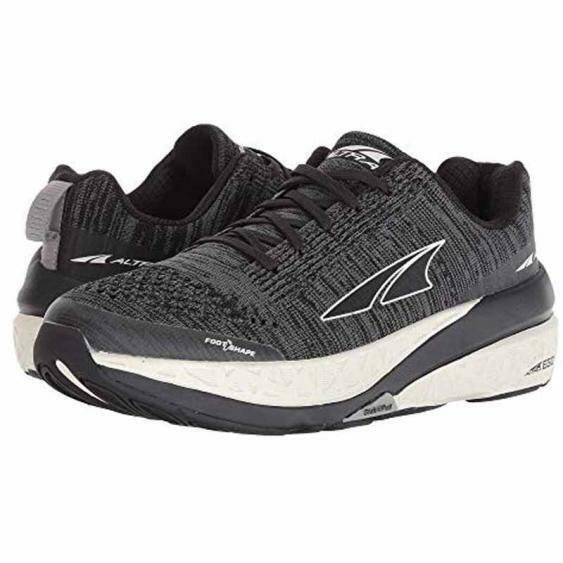 The revamped, knit upper and Altra EGO midsole along with the GuideRail and a full rubber outsole mean this shoe is both comfortable and ready to perform from 1 mile to 100. FOOTSHAPE TOE BOX: Altra's FootShape Toe Box allows the toes to relax and spread out naturally and the big toe to remain in a straight position for maxium stability and power. GUIDERAIL: A feature found on our dynamic support shoes that acts like a highway guide rail to provide guidance only when you need it. STABLIPOD: Acts as a stabilizing tripod by enhancing the three natural stability zones in your foot to help prevent excessive foot collapse or pronation.